SPIDER-MAN: Peter Parker (Tobey Maguire) is an ordinary guy who lives with his beloved aunt and uncle and quietly pines for the girl next door, Mary Jane (Kirsten Dunst). But when a genetically-modified 'super-spider' bites him while on a school trip, Peter develops unusual skills - fantastic acrobatic strength, supernatural awareness and a talent for web-spinning. It's not until tragedy strikes at home that Peter decides to use his new..
Own Marvel Kawaii - Spider-Man Mug from Deff, DVD, Blu-Ray & 4K Video Specialists - Free UK Delivery..
Get ready for hours of nonstop, super Spidey excitement as the world’s most famous web-slinging Super Hero returns in all 13 action-packed episodes from the hit first season of “The Spectacular Spider-Man!” The line of Super Villains determined to take down Spidey seems never ending. There’s Venom, Electro, Dr. Octopus, Sandman and Rhino - just to name a few. These criminals are almost more than he can handle and the stress would be eno..
Spider-Man Trilogy: The "Spider-Man" trilogy features the three critically-acclaimed "Spider-Man" films directed by Sam Raimi. Follow Peter Parker (Tobey Maguire) in these three adventures as he swings into action fighting super-villains Green Goblin, Doc Ock, Sandman and Venom and wins the heart of Mary Jane (Kirsten Dunst). The Amazing Spider-Man 1 + 2: Catch up to the beginning of the Peter Parker saga with The Amazing Spider-Man. Th..
Own Spider-Man - Homecoming 3D Steelbook Blu-Ray from Deff, DVD, Blu-Ray & 4K Video Specialists - Free UK Delivery..
A young Peter Parker/Spider-Man (Tom Holland), who made his sensational debut in Captain America: Civil War, begins to navigate his newfound identity as the web-slinging super hero. Thrilled by his experience with the Avengers, Peter returns home, where he lives with his Aunt May (Marisa Tomei), under the watchful eye of his new mentor Tony Stark (Robert Downey, Jr.). Peter tries to fall back into his normal daily routine – distracted b..
Own Spider-Man - Homecoming Premium DVD from Deff, DVD, Blu-Ray & 4K Video Specialists - Free UK Delivery..
Spider-Man Trilogy – Origins Collection: Swing into action with the groundbreaking original cinematic Spider-Man trilogy from direction Sam Raimi. Join Peter Parker (Tobey Maguire) as he becomes the iconic web-slinging Spider-Man, battles super-villains Green Goblin, Doc Ock, Sandman and Venom, wins the heart of Mary Jane Watson (Kirsten Dunst), and learns that with great power, comes great responsibility. The Amazing Spider-Man – Evolu.. The Amazing Spider-Man 1 & 2 Special Features The Amazing Spider-Man: The Amazing Spider-Man, Second Screen App, Download The App To Your iPad Or Sony Tablet S And Sync To the Film For An Even More Immersive Expeience, Filmmaker Audio Commentary With Marc Webb, Avri Arad And Matt Tolmach, The Amazing Spider-Man 2: 9 Additional Deleted Scenes With Commentary By Director Marc Webb Including 'Peter Meets His father', The Wages Of Heroism:.. The Amazing Spider-Man: Teenage social outcast Peter (Andrew Garfield) spends his days trying to unravel the mystery of his own past and win the heart of his high school crush, Gwen Stacy (Emma Stone). A mysterious briefcase belonging to his father, who abandoned him when he was a child, leads Peter to his dad's former partner, Dr. Connors. The discovery of his father's secret will ultimately shape his destiny of becoming "Spider-Man" a.. The Amazing Spider-Man & The Amazing Spider-Man 2 Special Features The Amazing Spider-Man: Deleted Scenes, Filmmaker Audio Commentary With Marc Webb, Avi Arad And Matt Tolmach, Stunt Rehearsals, The Oscorp Archives - Production Art Gallery The Amazing Spider-Man 2: Filmmaker's Commentary, 4 Deleted Scenes With Commentary By Director Marc Webb, Alicia Keys 'It's On Again' Music Video..
It’s great to be Spider-Man (Andrew Garfield). For Peter Parker, there’s no feeling quite like swinging between skyscrapers, embracing being the hero, and spending time with Gwen (Emma Stone). But being Spider-Man comes at a price: only Spider-Man can protect his fellow New Yorkers from the formidable villains that threaten the city. With the emergence of Electro (Jamie Foxx), Peter must confront a foe far more powerful than he. And as ..
Teenage social outcast Peter (Andrew Garfield) spends his days trying to unravel the mystery of his own past and win the heart of his high school crush, Gwen Stacy (Emma Stone). A mysterious briefcase belonging to his father, who abandoned him when he was a child, leads Peter to his dad's former partner, Dr. Connors. 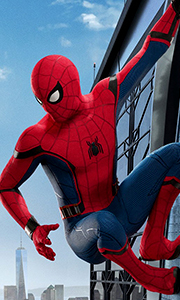 The discovery of his father's secret will ultimately shape his destiny of becoming "Spider-Man" and bring him face to fac..
Teenage social outcast Peter (Andrew Garfield) spends his days trying to unravel the mystery of his own past and win the heart of his high school crush, Gwen Stacy (Emma Stone). A mysterious briefcase belonging to his father, who abandoned him when he was a child, leads Peter to his dad’s former partner, Dr. Connors. The discovery of his father's secret will ultimately shape his destiny of becoming "Spider-Man" and bring him face to fac..
Get ready for the high-flying action and excitement of the all-new Spider-Man animated series. Based on the legendary Marvel comic book, Spider-Man has been developed into a never-before-seen computer animated style combining state of the art CG imaging with feature animation processing. The series follows the adventures of Peter Parker, who develops superhuman powers after being bitten by a genetically mutated spider. Now in college, P..
Spider-Man, Spider-Man 2, Spider-Man 3 Special Features Commentaries, Webisodes..
Own Spider-Man / Spider-Man 2 / Spider-Man 3 DVD from Deff, DVD, Blu-Ray & 4K Video Specialists - Free UK Delivery..
Two years have passed, and the mild-mannered Peter Parker (Tobey Maguire) faces new challenges as he struggles to balance his life as the elusive superhero Spider-Man. Tormented by his secrets, Peter is in danger of losing all those that he holds dear. His love for M.J. (Kirsten Dunst) becomes stronger and his friendship with Harry Osborn (James Franco) is complicated by the young Osborn's bitterness over his father's death. These relat..
Peter Parker (Tobey Maguire) finally has finally managed to strike a balance between his devotion to M.J. (Kirsten Dunst) and his duties as a superhero. But when his suit suddenly changes, turning jet-black and enhancing his powers, it also transforms Peter, bringing out a dark vengeful side that he struggles to control. He must now battle his inner demons as two of teh most-feared villains yet, Sandman (Thomas Haden Church) and Venom (..
Peter Parker (Tobey Maguire) finally has finally managed to strike a balance between his devotion to M.J. (Kirsten Dunst) and his duties as a superhero. But when his suit suddenly changes, turning jet-black and enhancing his powers, it also transforms Peter, bringing out a dark vengeful side that he struggles to control. He must now battle his inner demons as two of the most-feared villains yet, Sandman (Thomas Haden Church) and Venom (..
Peter Parker (Tobey Maguire) has finally managed to strike a balance between his devotion to M.J. (Kirsten Dunst) and his duties as a superhero. But when his suit suddenly changes, turning jet-black and enhancing his powers, it transforms Peter, bringing out a dark vengeful side that he struggles to control. He must now battle his inner demons as two of the most-feared villains yet, Sandman (Thomas Haden Church) and Venom (Topher Grace)..
Peter Parker (Tobey Maguire) is an ordinary guy who lives with his beloved aunt and uncle and quietly pines for the girl next door, Mary Jane (Kirsten Dunst). But when a genetically-modified 'super-spider' bites him while on a school trip, Peter develops unusual skills - fantastic acrobatic strength, supernatural awareness and a talent for web-spinning. It's not until tragedy strikes at home that Peter decides to use his new powers to f.. It's been a tough week for Peter Parker. His two best friends are mad at him, Aunt May is behind on the bills and Flash Thompson is still bullying him at school. It hasn't been a easy for Spider-man either. The Enforcers are trying to destroy him, the Vulture is seeking revenge on Mr. Osborn, Electro is wreaking havoc on the city and his mentor, Dr. Connors, just transformed into The Lizard - a reptile on a rampage. But with great power.. Your favorite web-slinging Super Hero returns for excitement in more episodes of this animated adventure! Peter Parker is on top of the world when his date, Mary Jane Watson, is the hit of the Midtown High Fall Formal, sending Peter's popularity rating sky high. But he's brought down to earth with a resounding thud when the Green Goblin threatens to beat Hammerhead and Tombstone at their own criminal game. When Dr. Octavius joins the ba.. When the world's most dangerous super villains attack New York City, a young Peter Parker finds himself juggling two lives: one as an ordinary high-school student and one as the Hero of New York City! Jump into the web-slingers' amazing world as he teams up with members of Marvel's mighty Avengers in Ultimate Spider-Man: Avenging Spider-Man. Get ready for non-stop mayhem as the Hulk smashes his way into Spider-Man's life, sick with an a..
Gear up for fun and excitement as everybody's favorite web-slinger unleashes his coolest vehicles and technology in Ultimate Spider-Man: Spider-Tech. Join Spider-Man as he battles an incredible team of villains and faces his biggest challenge yet…teen high-school drama! When Peter Parker is offered the chance to become the Ultimate Spider-Man, Midtown High becomes a secret operations base for young heroes. Get in on the action as Spidey..
Own Ultimate Spider-Man - Ultimate Tech DVD from Deff, DVD, Blu-Ray & 4K Video Specialists - Free UK Delivery.. Prepare for the ultimate clash of good vs. evil as Spider-Man faces off against the world's most sinister super villains in this special collection. Experience the thrills and excitement of six epic battles in Ultimate Spider-Man: Spider-Man vs Marvel's Greatest Villains. Secondary school is a big enough challenge for most teenagers, but things get a whole lot tougher for Peter Parker when Dr. Doom, Loki, Doctor Octopus and Venom come l..
Gear up for fun and excitement as everybody's favourite web-slinger unleashes his coolest vehicles and technology in Ultimate Spider-Man: Spider Tech. Join Spider- Man as he battles an incredible team of villains and faces his biggest challenge yet... teen high school drama! When Peter Parker is offered the chance to become the Ultimate Spider-Man, Midtown High becomes a secret operations base for young heroes. Secondary school is a bi..
Own Marvel Kawaii - Spider-Man Villians Mug from Deff, DVD, Blu-Ray & 4K Video Specialists - Free UK Delivery..
Own Marvel Retro - Spider-Man Comic Mug from Deff, DVD, Blu-Ray & 4K Video Specialists - Free UK Delivery..
Own Marvel Retro - Spider-Man Panels Mug from Deff, DVD, Blu-Ray & 4K Video Specialists - Free UK Delivery..
Own Spider-Man - Homecoming DVD from Deff, DVD, Blu-Ray & 4K Video Specialists - Free UK Delivery..
Own Spider-Man - Homecoming With Figurine 4K Ultra HD from Deff, DVD, Blu-Ray & 4K Video Specialists - Free UK Delivery..
Own Spider-Man - Legacy Limited Edition 4K Ultra HD from Deff, DVD, Blu-Ray & 4K Video Specialists - Free UK Delivery..
Own Spider-Man Into The Spider-Verse - Comic Mug from Deff, DVD, Blu-Ray & 4K Video Specialists - Free UK Delivery..
Own Spider-Man Into The Spider-Verse - Duo Mug from Deff, DVD, Blu-Ray & 4K Video Specialists - Free UK Delivery..
Own Spider-Man Into The Spider-Verse - Miles Mug from Deff, DVD, Blu-Ray & 4K Video Specialists - Free UK Delivery..
Own Spider-Man Movie Collection (5 Films) DVD from Deff, DVD, Blu-Ray & 4K Video Specialists - Free UK Delivery..